busted out some topshop clog-ish wedge shoes i got last summer. i barely wore them then, but they seem to go with more of the clothes i have now. they're surprisingly difficult to walk in, it's like walking with bricks strapped to your feet, but they're very comfortable. just threw this outfit together quickly, which is something i don't do often - i tend to really plan my outfits, and even then suffer from 'would it look better with this instead' or 'maybe i shouldn't wear this with that' etc. i'm definitely prone to overthinking my outfits. 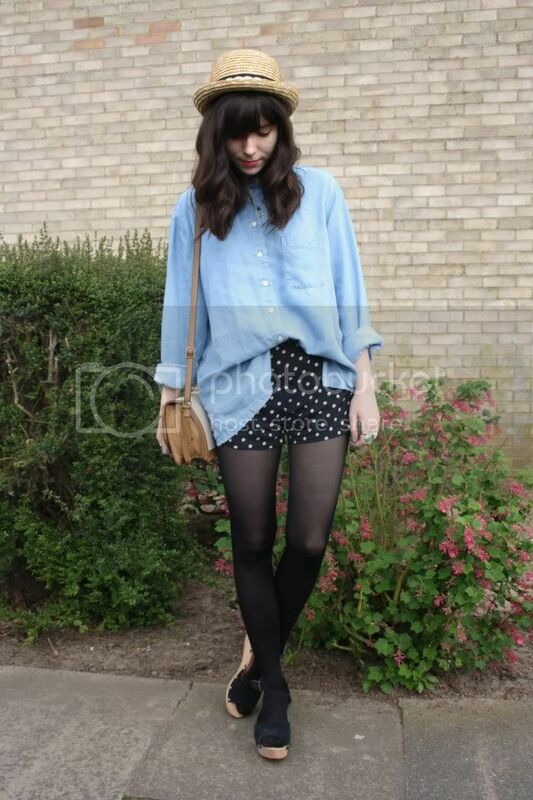 i wish i could be more effortless with my dressing... sadly that's just one more reason why i'll never be alexa chung! None of us will ever be Alexa Chung, it's a sad fact of life! I'm really, really liking this outfit! Sometimes outfits that we just throw together work better than outfits that are over thought! Love those shorts! You make throwing outfits together look so effortless! still looks good! even if you throw it together quickly ! I love this outfit, you're passing on your polka dot love because now I can't stop thinking about buying something polka dot. I have these shoes and I agree they are impossible to walk in! ha! i am such an outfit over planner! i even have to semi plan and picture my wardrobe as i drift off to sleep for the next day! i always love all your hats. this hat has inspired me, and i've been searching all of my vintage haunts for one! I love the shirt and the clogs are nice too. 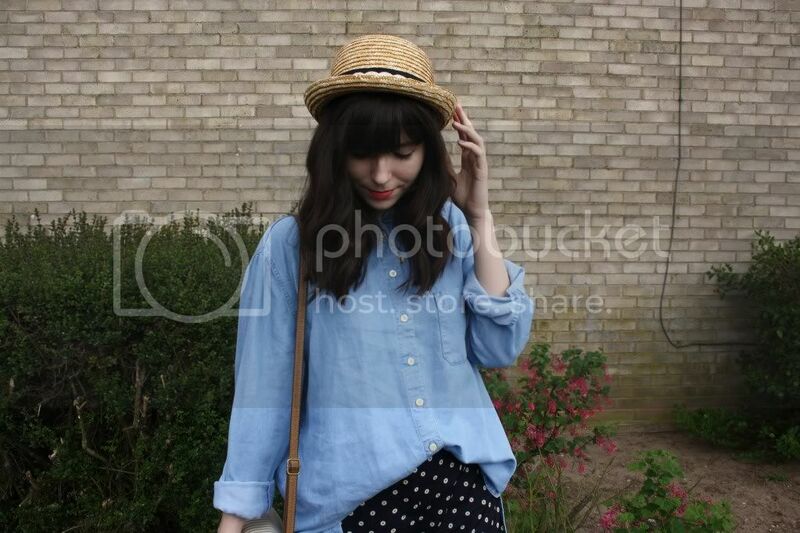 This outfit is so lovely :) I really like your straw hat too, perfect for Spring! I think your polka dot obsession is rubbing off on me. I love this outfit! Ah, to be like Alexa and have her wardrobe, what a dream :) Love yr polkadot shorts and shoes! Don't worry I am not effortless either! but very adorable and alexa chung-esque! I love those dotty shorts. Don't worry, alot of effort goes into looking effortless. I share your love towards polka dots and I really like the way you can incorporate them in every outfit! I have to plan outfits too, I would be jeans and t-shirts all the time if I didn't. Totally agree about the clog sandals dilemma, so comfy but bizarra to walk in! the lipstick suits you so well! Cute, but why do you take so many photos of the same outfit? Isn't one enough?